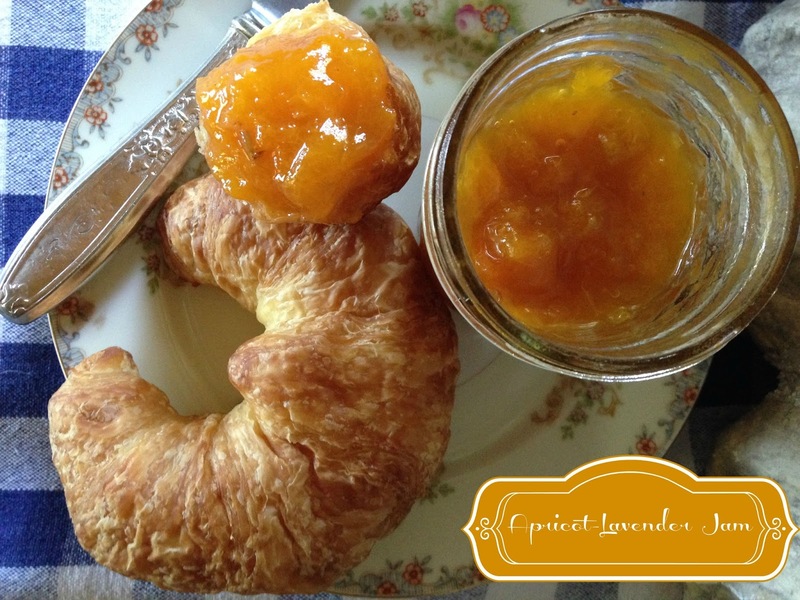 Sweet, fruity apricots, are paired with delicate lavender, resulting in a delicious jam. 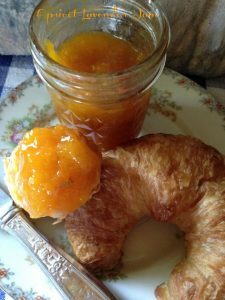 Apricot Lavender Jam is perfect smeared on scones, biscuits, croissants or warm, thick slices of country bread. This is a delicious jam with a delicate lavender taste. The perfect accompaniment to scones and croissants. Apricots and Lavender are meant for each other..add a splash of Bourbon or Honey (or both)….and you’ll have a true treat for your taste buds. Don’t believe me, then you’ll just have to make this jam and taste for yourself! Apricot [AP-rih-kot; AYP-rih-kot] This fruit of ancient lineage has been grown in China for over 4,000 years. It now thrives in most temperature climates, with California producing about 90 percent of the American crop. A relative of the peach, the apricot is smaller and has a smooth, oval pit that falls out easily when the fruit is halved. The color of skin can range from pale yellow to deep burnt orange; the flesh from a golden cream color to a brilliant orange. Apricots are highly perishable and seasonal. When buying apricots, select plump, firm fruit with a uniform color. Store in a plastic bag in the refrigerator for up to 3 to 5 days. Jam is a thick mixture of fruit, sugar and sometimes pectin that is cooked until the pieces of fruit are very soft and almost formless. It is used as a spread for bread, croissants, scones, a filling for pastries and cookies. Apricot Lavender Jam is fruity and sweet, with a hint of honey and a slight floral taste from the lavender. A true taste sensation. Sweet and Delicate, with a hint of floral taste from the lavender. Remove the apricot pits, cut the fruit in half, sprinkle the fruit with sugar, stir to combine. Tie 3 to 4 teaspoons dried lavender buds in a small cheesecloth bundle. Sink in the middle of the fruit, stir in bourbon or honey. Let macerate overnight in the refrigerate. Prepare water bath canner and sterilized jars. Bring the apricot mixture to a boil in a wide pan, adding 1/4 teaspoon butter to diminish the foam. Continue to cook, stirring to keep mixture from scorching. Cook until gel point is reached. Remove the bundle of lavender. Stir in the reserved 1 teaspoon lavender buds. Ladle the jam into prepared jars. Seal and process in a water bath canner for 10 minutes. Remove the canner lid, turn off the heat and let sit for 5 minutes. Remove the jars, let sit undisturbed until the jars are thoroughly cooled, 24 hours.